Dos and Don’ts of Job Interview Body Language. It’s an often-repeated myth that an interviewer will make up their mind about you in the first thirty seconds of a job interview. Of course, if this were true, interviews could easily be condensed and jobs would only be given to the best dressed people who have the best posture. 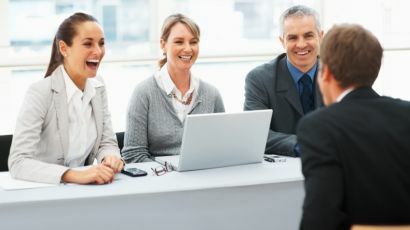 First impressions are, however, massively important, and they can help shape the rest of the interview as a whole, and lead to more comfortable, flowing rapport. Your posture, body language, clothes and how you smile are all taken into account before the interview has even started, so it’s important to think about what your body language is saying from the moment you enter the building to the moment you leave. Interviewers can read you like a book, so give them something good to read. Do: Keep a straight posture. Don’t: Slouch or Remain Still. 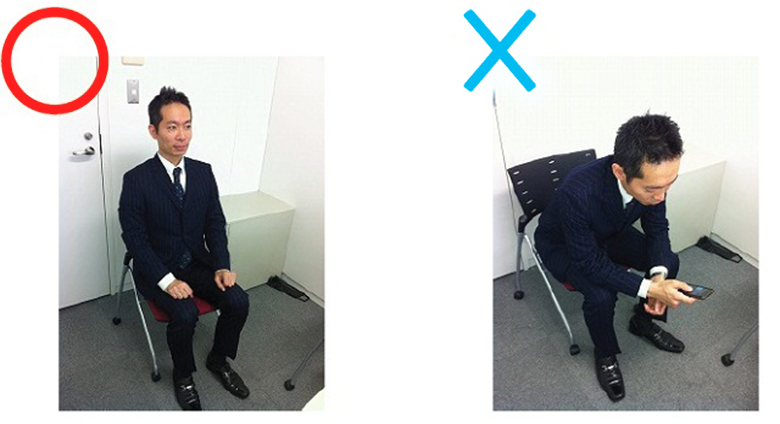 Your posture can say a lot about you very quickly, so make sure to consider it when you first sit down. Slouching can make you appear disinterested and distant. Keeping entirely still can make you seem frightened and wooden. It can also make interviewers feel uncomfortable, when you really want to make them feel engaged so that you can really show them you in the best possible light. A simple trick to keep a good posture is to imagine that you’re head is being held up by a piece of string attached to the ceiling. You can also lean forwards slightly, as this demonstrates that you are listening with interest and that you are excited by the job opportunity. It’s important that your posture says that you are relaxed but confident, as this will project how you sound and make you seem like a very capable and enjoyable person to work with. Do: Keep a sensible distance between you and the interviewer. Don’t: Invade their personal space. While it’s important to lean forwards to show you are really paying attention, make sure there is a sensible distance between you and your interviewer. Sitting too far away gives the impression that you don’t care all that much and that you are keen to leave as quickly as possible. Sitting too close will make the interviewer feel uncomfortable, and comes across as being aggressive. Do: Keep eye contact. Don’t: Stare. Make sure to look your interviewer in the eye. You can gauge their interest in what you are saying so that you can zone in on subjects that impress or interest your interviewer, and you can also make a more personal bond with them. Make sure not to stare at them constantly, however, as this can make you appear vacant or shy. Staring deep into their eyes can make an interviewer feel uncomfortable, and is another signifier of aggression. You want to project a comfortable and confident image through your eye contact as much as your posture. If there is more than one interviewer, make sure to look at the person who asked you the question you are answering, to show that you are fully engaged with them all. You should generally maintain eye contact for about 7-10 seconds at a time. Looking at what your interviewer is doing, and taking stock of your surroundings can also make you appear attentive and excited by the building you hope to work in but constantly looking around may also make you appear less open or interested. For example, don’t stare at the picture on their kitten calendar, see if you can see anything interesting coming up later in the month instead. Do: Keep an enthusiastic expression. Don’t: nod constantly. Your expression can really magnify what you are saying in a job interview. If you are telling an interviewer that you are really excited by or passionate about something, make sure your expression is also saying it as well, otherwise they won’t be very convinced. Smiling will make you seem like an approachable, enthusiastic person and a positive person to work with. You don’t want to appear as though you are just memorising and repeating your answers either by leaving your expression blank, as this is less likely to lead to a conversation where you can go into more detail about anecdotes from your professional life. Nodding can also be easily overused. Bobbing your head like a nodding dog gives the impression that you are not really listening, just absent-mindedly hoping to appear interested. Nod sparingly when they say something that really is interesting to you, and show your engagement with an enthusiastic, attentive expression throughout. Do: Use hand gestures. Don’t: Fidget. You’ve got your posture and expression confident and comfortable, but what do you do with your hands? You want to keep your hands where they can be seen. Having them behind your back gives an air of dishonesty, keeping them in your pockets appears disinterested. It also inhibits your movement, and can make you come across as being stiff or nervous. You can use hand-gestures to emphasise something you really want the interviewer to pick up on, but if you over-do your hand-gestures you can seem aggressive, or over-rehearsed. It’s important to keep your shoulders facing your interviewer, and use hand gestures that are open and confident to underline what you are really passionate about. You can also mirror the body language of your interviewer, as this can help them engage fully with you. But don’t mirror everything, as this can be transparent and make an interviewer feel self-conscious. Make sure not to fidget either, as this can distract an interviewer and make you seem nervous. If you bite your nails, keep that under control for the interview. Remember, you can always have a good chew on them when you get home. Zone in on any physical tics you have, so that you can make sure you are not doing them when you are in an interview. Avoid rubbing your nose or neck, as this gives an impression of dishonesty and a lack of confidence. Touching your lips, nose or ears is a sign of lying, so even if you aren’t telling a fib, make sure to avoid touching your face when talking. When you are not using your hands, keep them clasped loosely in your lap or resting on your knees. Keep both feet on the floor, and don’t jiggle either of them constantly, as this is a tell-tale sign of disinterest or a burning desire not to be there anymore. You want your body language to give the impression that you are comfortable and open but really interested in the position at hand. Of course, you shouldn’t spend the interview constantly thinking about your body language. Just make sure to check over the body language you should and shouldn’t use. Preparation beforehand is always the best way to help you relax and be positive in a job interview, and if you feel relaxed and positive, this will be reflected in your body language as well. ← The Worst Case Scenario, or Why Your Job Interview Will Be Fine.